Want a sports utility vehicle that doesn't scrimp on horsepower? 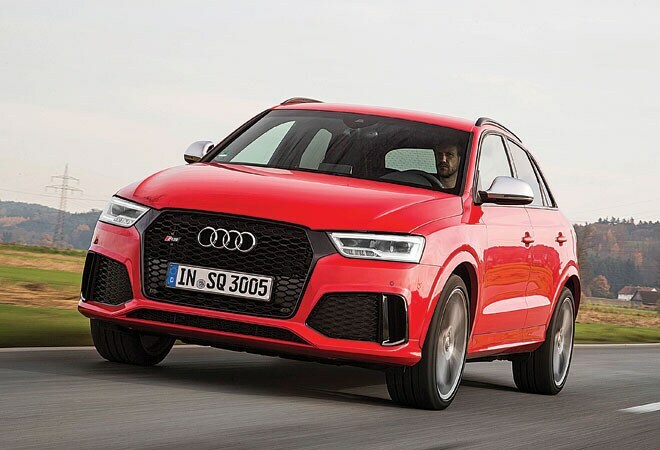 The RS Q3, a souped-up version of the Audi Q3, may just fit your bill. What's opulence without power? It's probably to answer this very question that Audi has come out with the RS variant to its all-new Q3 line-up. At first glance, you notice that the physical changes seen on the Q3 has found its way into the RS version too. There's a single frame grille flanked by metal surrounds, a sleeker pair of headlamps, sportier bumpers that lends itself to the overall feel of the car, matt aluminium finish mirrors, and a magnificently oval exhaust pipe. The RS Q3 rides on 20-inch wheels and sits 20 mm lower. Steal a glance inside, and you see that Audi has spruced up the cabin with a ravishing flat bottom steering wheel along with specially embossed seats. The instrument panel has been tweaked ever so slightly; it has grey inlays with clearly visible RS logos. The counters on the information screen, on the other hand, seem to clamber over each other to let you know everything you need, from turbo boost pressure to oil temperature and lap timer. 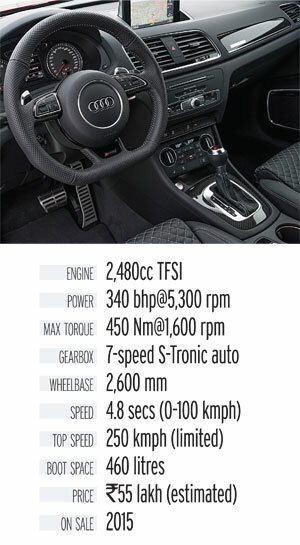 With a 2.5-litre five-cylinder engine derived from the Audi TT RS, the firepower under the bonnet is as impressive. What catches your attention, however, is the fact that the engine has received a complete retune; as a result, it now pumps out 340 bhp of power and 450Nm of torque. Start the RS, and it welcomes you with a distinct warble from the exhaust (this one has a switchable flap to enhance the audio). Step on the gas, and the big SUV lurches forward with enormous grunt. The short-geared nature of the vehicle allows it to gather speed rapidly while the seven-speed automatic box kicks into action at the right time, making the driver lurch back into his seat in exhilaration. The Audi RS Q3 can go from 0-100 km per hour in just 4.8 seconds, and achieve a top speed of 250, reducing your surroundings to a near-blur. Driving through the German autobahns in the Audi RS Q3 was quite an experience, especially because the slightest dab at the throttle when cruising at 180 kmph would propel it ahead like a veritable rocketship and make the horizon seem as if it were within touching distance. Fortunately, autobahns have no federally mandated speed limit for some classes of vehicles, and this baby is certainly one among them. But driving at break-neck speed doesn't necessarily mean losing control over your vehicle, something that the RS Q3 amply demonstrates. Despite making you sit rather high up inside the cabin, the SUV displays admirable maneuverability and some great handling characteristics. The 'ausfahrts' or exits around the Autobahns presented some truly great corners, and the RS Q3 tackled them without any drama. The steering, on the other hand, offers great feedback at high speeds. All in all, the RS Q3 is a great option for anybody who wants an SUV that packs the might of a monster, and yet harbours a heart that cares for the environment. The author is the Road Test Editor, AutoBild.